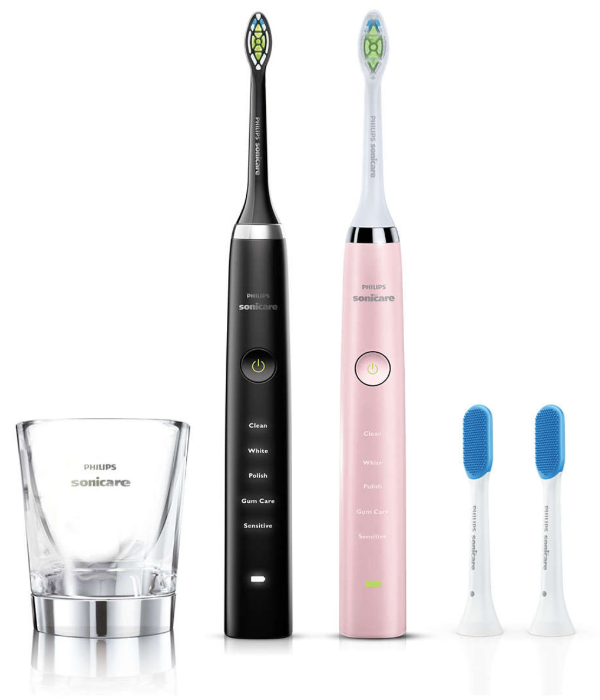 At PDA, we often get asked the question, “With so many options, what type of toothbrush is best for me?”…There are hard brushes, medium, soft, electric, spin, self-timers, phone apps, and perhaps the most compelling of all, the new trendy electric toothbrushes seen on social media. It is easy to see how one would get confused! …It is more about the brushing technique than the actual brush. As long as you have the brush at a 45 degree angle along the gum line, cover all surfaces of the teeth, and use gentle pressure, you will be good to go. However, a good rule of thumb to remember ———> only buy a SOFT toothbrush. Medium and hard brushes should honestly not even be manufactured. Plaque is very soft and does not take much pressure to remove, and the more firm the brush, the more likely you will cause gum recession over time. Manual toothbrushes are just fine to use, if used properly; though electric toothbrushes are truly beneficial for everyone. One major benefit is that, with an electric toothbrush, you no longer use a scrubbing motion. Instead, you slowly move the electric brush around your teeth and let the sonic motion of the toothbrush head do all the work. This is a wonderful way to prevent gum recession from getting worse. If you are someone who builds up heavy tartar, an electric toothbrush can also help decrease the tartar between your dental hygiene appointments. Is Easy and Faster Better? The truth of the matter is that while technology and materials are indeed getting better, cutting steps to save time isn’t usually a great idea. The steps are there for a reason. You may be able to save time by combining or eliminating steps, but if the quality is compromised by doing so, what has anyone gained? have come a long way in the past 5 years and definitely have their place in dentistry. These crowns can be wonderful - especially in an emergency situation - and have great patient appeal. Who wouldn’t rather get a crown in one visit and be done with it? However, due to the fact that the skilled lab technician is removed from the process, the esthetics and fit of the crown are often not as ideal; With extensive team member training, in-office crowns can be beautiful - just be cautious and know that a crown is not "just a crown"...there is a wide range of quality. Stay tuned for how we will continue to incorporate this popular technology into our work flow at Palmetto Dental Associates. can now be found in practically every mall in America. Dental research is inconclusive on whether the LED light is effective at all. “One hour whitening” may initially appear to make the teeth significantly whiter, but that is because the high percentage bleaching agent and the light dehydrate the teeth, giving them a falsely lighter appearance. The tried-and-true way to whiten teeth is via custom trays (made by your dentist) and bleaching gel worn daily over a 2-4 week period. Many patients prefer this custom tray method, because the bleaching gel does not burn or irritate the gum tissue. At Palmetto Dental Associates, we can makes these custom trays in one visit and you can keep them for years to touchup your whitening whenever desired! seen recently on social media - should be avoided. These pastes are very abrasive and thus may indeed remove mild surface stains, as would a dental cleaning, but they certainly do not lighten the tooth’s internal color. Be aware that, if used frequently and long-term, these toothpastes will strip away the white tooth enamel making teeth more yellow in appearance, more sensitive and more susceptible to cavities. According to the Journal of American Dental Association (JADA) and their analysis of 118 studies done on the topic, there is no evidence that supports these products do what they say, and furthermore, they discovered they can actually cause harm by wearing away the enamel. are currently on primetime T.V. commercials which make lofty claims that patients can forego bone grafting surgeries and multiple appointments by using mini implants. Be very cautious of mini dental implants; they do not fuse with the bone and are thus not predictable long term. The only potential use of mini implants is in a very short term, temporary situation. Don’t be fooled by T.V. marketing and remember, if it seems too good to be true, it probably is. Give us a call if have a question about dental products seen in the media - one of our dentists is always happy to speak with you. has always been to do things the correct way and not the quickest way. While we never want to be the last ones on the block to adopt new dental technology, we certainly don’t ever want to cut corners at the expense of quality. You can rest assured that any dental technology we bring to you at Palmetto Dental Associates has been carefully considered and researched by our dentists beforehand. If you have any questions about our state-of-the-art technology offerings, we welcome your call at 803-808-0888. * Before and after veneer case by Palmetto Dental Associates (Dr. Franklin Shull) and CMR Dental Lab; click on each image to see it in its entirety. Porcelain veneers can achieve beautiful, nearly flawless teeth; however, veneers are not necessary for everyone. Sometimes significant cosmetic improvements can be achieved by small tweaks of tooth shape or color. If you have nice enamel with minimal fillings, then teeth whitening, minor orthodontics, and edge shaping/contouring can go a long way. Porcelain veneers are wafer-thin shell coverings that go on the front surface of your teeth. Even though they are very thin, because of the strength gained when bonding them, veneers are not fragile and predictably last for many years with proper oral hygiene. Protecting them by wearing a bite guard appliance is also important. 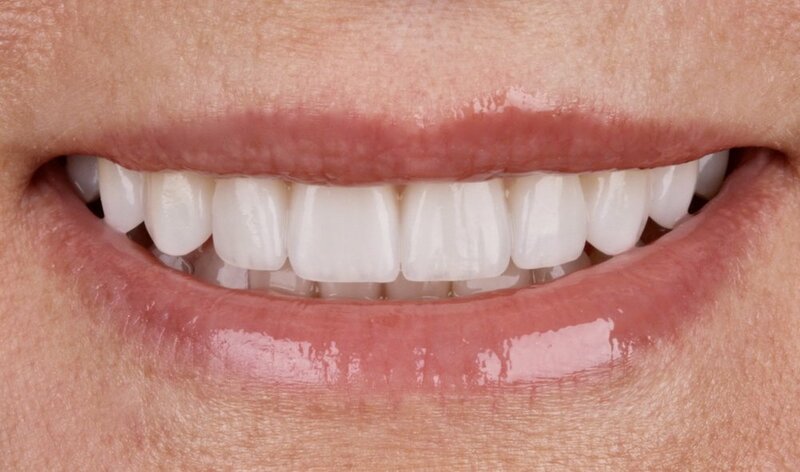 Porcelain veneers are now made from a strong, highly esthetic glass ceramic. This is similar to the material used years ago, but looks much more natural. Veneers have no metal substructure so you don’t have to worry about getting the dreaded “gray line” at your gumline. Dental veneers do not stain or dull, and seamlessly cover gaps, stains, cracks and chips. There are ways to see what you will look like with veneers prior to undergoing the procedure. Your dentist will begin with a comprehensive exam and smile analysis to determine what steps are necessary to achieve the smile you desire. A digital "mock-up" can be designed, producing a before and after visual of your teeth with veneers. In addition, a material called PMMA can be milled into a custom shim that will allow you to “try on” veneers to see if you like the final result. If you are interested in improving the esthetics of your smile, or just have more questions on the topic, give us a call at 803-808-0888 to schedule a consult with one of our four wonderful cosmetic dentists. Experience the difference of positive, comprehensive dentistry! How Do I Know I Can Trust My Dentist? Trust is a major factor in a positive dentist/patient relationship. With so many dental offices from which to choose these days, read below to determine how to find a trustworthy dentist who truly has your best interests at heart. “How do I know I can trust my dentist?” This is a question we are frequently asked by friends or family members who live out of town and are unable to come to Palmetto Dental Associates in Lexington, SC. With the advent of corporately-owned dental offices popping up on what seems like every corner, it is important to know the characteristics of a trustworthy dentist. Ask your friends which dentist they see and why they enjoy the practice. Word-of-mouth referrals are still the absolute best, because who can you better trust than your friends and family. Also check out the practice’s online Google reviews. Many dental offices also have a Facebook page where patients can leave reviews as well. Look for a practice with an up-to-date website, ideally with real-patient case photos and not stock photos. You can easily tell the general quality of dentistry being performed at a practice with a quick glance at the before and after photos. It is also a plus if a practice website has a blog section that is updated frequently. A blog lets you know that the practice is actively seeking to remain relevant and on the cutting-edge of dentistry, all while educating their patients. Look for an office with courteous front desk team members when you call to make your new patient appointment. They should take time to tell you about the office and assist you with any questions you may have. Ideally, you want to choose an office that schedules you to first see the dentist for a comprehensive new patient exam vs. your first appointment being for a dental cleaning. There are several different types of dental cleanings, and there is no way to know which type of hygiene appointment you will need until the dentist examines you. The first time you meet the dentist and have a comprehensive exam, he or she should spend quality, unhurried time (usually 1.5 hours) getting to know you, your mouth, and your overall health history. The dentist should collect intraoral photos and radiographs (xrays) of your teeth and place these on a screen to show you potential problems and explain options for correction. This brings us to our next point - options. No dentist should dictate to you what treatment you have to have. It is his or her job to point out everything that is not ideal with your teeth, and then you both should determine the correct treatment options for your personal and financial situation. We all know the answer to this question based on the old adage..."a picture is worth a thousand words." When it comes to restorative and esthetic dentistry, a picture is worth much, much more. Years ago in dentistry, crowns were matched based on a simple plastic tooth shaped shade (color) guide. The same method was used when matching tooth colored fillings to teeth. Over the years, dental porcelain and tooth colored filling materials have become more and more beautiful and high-tech. These advances allow us to create dental restorations that truly mimic natural teeth. We have come to discover that the easiest and most predictable way to record the color, shape, and texture of teeth is through the use of high-quality digital photographs. Photography in dentistry is certainly nothing new. For years, many dentists have been documenting their work with slide photography and prints; but digital photography has revolutionized dentistry much in the same way it has transformed our ability to capture life’s special moments with our families and friends. We now have the ability to email and share photos with an out-of-state laboratory ceramist , the person who actually makes the crowns or veneers. This collaboration is critical to meeting a patient’s expectations and in producing a dynamic and natural smile. An excellent indicator of the quality of “cosmetic” work in a dental office is the quality of the photography. Before and after photos should be crisp and detailed. Viewing similar cases that the office has completed should give the patient a good idea of what to expect with his or her own teeth, whether it involves a single crown, a filling, or the entire smile. Communication is key, whether it is a patient communicating with a dental team member or the dental team communicating with the lab ceramist. Digital photography is vital to this communication process and is certainly something we could not do without at Palmetto Dental Associates! The more information that can be exchanged, the better and more predictable the results will be. And of course, when everyone is happy, smiling for the photos is a snap! What's that dark line at the gum line of my crown (or "cap")? This is a question that we hear frequently in our office during our new patient exams. It’s a great question, so let’s shed some light on the topic. The majority of the crowns (or "caps") that have been fabricated worldwide are of the “porcelain bonded to metal" variety. What that means is that there is a metal substructure that fits over the prepared tooth upon which porcelain is layered to make it look like a tooth. Many times this metal and porcelain junction can result in a black line at the base of the crown, where it had initially been tucked slightly under the gums. If any gum recession occurs, the patient may then see the black metal line. While the porcelain fused to metal crown is still a very durable, long lasting restoration (and can be fabricated in a method that doesn’t show the “black line”), we now have new materials available to us that allow for crowns to be made with absolutely no metal at all. Is this a brand-new concept? No, it is not. We have been making metal-free crowns and veneers for many years. Unfortunately, in past times we have had to sacrifice strength in order to gain the esthetic benefit of a metal free crown. With the advent of materials like porcelain bonded to zirconia, and even more recently, a highly esthetic porcelain called Emax, we are able to achieve the ultimate in esthetics without sacrificing strength. With the advent of these new materials and by using truly artistic master ceramists to fabricate our crowns, no longer do we have to make crowns that look like crowns. Instead, we now can fabricate crowns that look like, well... beautiful, natural, healthy teeth!